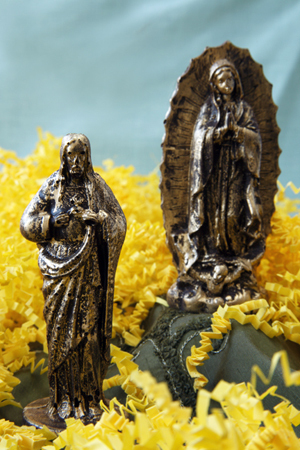 Jesus and Our Lady of Guadalupe in exquisite, gold-painted 72% cacao chocolate for the connoisseur’s Easter basket. Photo by Katharine Pollak| THE NIBBLE. WHAT IT IS: Artisan chocolate. WHY IT’S DIFFERENT: Cutting edge flavors and shapes—Jesus and Our Lady of Guadalupe, above, plus Buddha and Moses, along with a vividly-flavored selection of bonbons in traditional shapes. WHY WE LOVE IT: Beauty and great taste. WHERE TO BUY IT: BondStChocolate.com. CAPSULE REPORT: You’ve got a sophisticated palate. You want new food experiences. We’ve got a lot of them here for you today, starting with the chocolate statues in the photo. Do you really want an Easter basket with jelly beans, marshmallow eggs and a chocolate bunny? Or would you rather have confections from a fine chocolatier who thinks outside the basket? The answer may be “both”; but order early if you want to acquire these beautiful pieces of edible art from Bond Street Chocolate. They sell out! To make these beautiful chocolate statues of Jesus and Our Lady of Guadeloupe (as well as Buddha and Moses), Bond Street Chocolate uses the finest E. Guittard’s 72% Coucher du Soleil, a dark, rich, smooth couverture chocolate with a creamy mouth feel and hints of thyme and jasmine. With all due respect, it is chocolate to pray for. The chocolate is poured into handmade chocolate molds. The molded pieces are painstakingly hand-painted with edible gold leaf. They are beautiful to look at, and you can keep the chocolate for up to a year as an object d’art before you have to decide whether it’s art or food. For those who want a box of classic chocolates, Bond Street Chocolate’s sophisticated bonbons are available in traditional shapes, but with anything but standard flavor combinations—several with fine spirits such as Bourbon, Cachaça, Rum and Tequila, as well as florals and herbs such as hibiscus, lavender and tea. 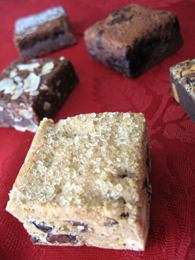 See them in the full review below, and send a box to your favorite chocolate gourmet. And if that’s not enough, we’ve revisited all of last year’s traditional Top Pick Easter Chocolates— chocolate rabbits, marzipan eggs and more. Let the good times (and the Easter eggs) roll! Mari’s New York Brownies. A delectable gift for those who don’t like chocolate and candy, these beautifully-packaged brownies in sophisticated flavors are a breath of spring. Read the review. Yummy Cupcakes. 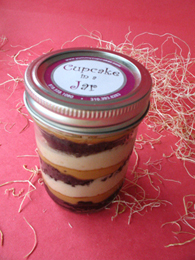 Send them Yummy Cupcakes In A Jar, and they’ll forget that the Easter Bunny and jelly beans every existed. One of our most longed-for Top Picks Of The Week, we dream of them. Read the review. 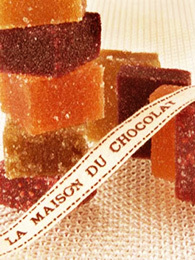 Maison du Chocolate Pate de Fruits. Let the kids enjoy the jelly beans as you explore the majesty of these pate de fruits. We discovered them in Paris decades ago and they’re still our favorite. Read the review. mints and other favorite confections. Traditional chocolate rabbits, marzipan eggs, and more gourmet Easter candy from our favorite chocolatiers. Last year’s Easter Top Picks, updated for 2010. Something new, something green, something fusion: lime-tasting Agwa liqueur, made from Bolivian coca leaves, make bright green cocktails. Yet, these bonbons look like they have stepped right out of Bond Street. They belong for sale among the fashion boutiques and jewelers that grace the street (Armani, Bulgari, Burberry, Cartier, Chanel, Gucci, Harry Winston, Hermès, Louis Vuitton, Sotheby’s, Tiffany, Yves Saint Laurent and the like). If you like fine chocolate, you’ll want to sample the wares. Step right up to the second page of this article to learn more about them. 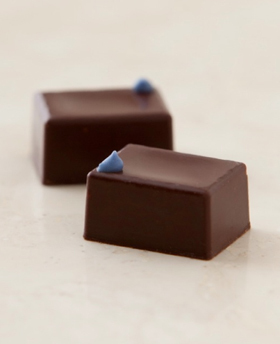 So smart and fashionable, these lavender ganache chocolates dotted with a candied lavender leaf would be equally at home in London’s Bond Street. Photo courtesy Bond Street Chocolate.